I liked this book, but it was really hard to read. This is a collection of Ta-Nehisi Coates' previous essays written for The Atlantic. I had read them on his blog, but here they are expanded with new introductions to each article. These introductions, detailing Coates' state of mind while writing them, are invaluable. The essays form a picture of the meaning of Barack Obama's presidency, coming from the mind and pen of a gifted African-American man who has become one of this country's foremost writers on race. That being the case, the epilogue of this book, a new essay titled "The First White President," was the equivalent of a body blow. Coates lays bear the election of the current horrid occupant of the White House as belonging both to the backlash against President Obama and a last-gasp effort to maintain white supremacy in this country. (And, as we've found out since, prodded along by Russian hackers, and the insane Republican obsession with Hillary Clinton and her husband.) This final essay is a downer, buoyed (if one can call it that) by the author's trademark pessimism. But that makes this book even more important, and I hope it will find its way into school classrooms as required reading on race in America. 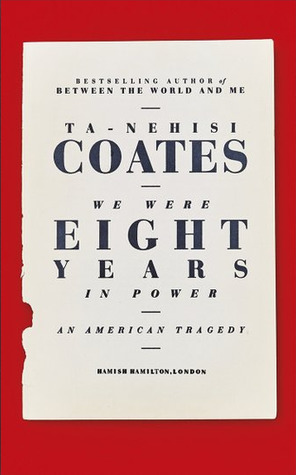 Sign into Goodreads to see if any of your friends have read We Were Eight Years in Power. I've really enjoyed Ta-Nehisi Coates over the years. It was a huge blow last year when he was rudely chased off Twitter, not by right-wing ideologues but by old-school black progressives, who wish to stay with the failed policies of the past, rather than break with their dependency upon false optimism. Now, where do I send those Brussels sprouts I owe the man? Any brother who likes his Brussels is a fine brother indeed.